SculpSure is a breakthrough in non-invasive body contouring, designed to treat stubborn areas of fat that seem impossible to get rid of, even with diet and exercise. Thank you for your interest in Innovative Aesthetic's SculpSure services. Contact the Innovative Primary Care Office today at 480.776.0626 to schedule a consultation to determine whether SculpSure might be right for you. Even with diet and exercise, most people have stubborn pockets of fat that seem impossible to lose. SculpSure’s body contouring technology is able to target and destroy these fat cells without affecting the skin’s surface, without surgery or downtime. SculpSure’s non-surgical 25-minute procedure uses light-based technology to permanently destroy up to 24%* of treated fat in problem areas such as the abdomen and love handles. Over time, these damaged fat cells are naturally absorbed and removed from the body, with results seen as quickly as six weeks, and optimal results typically seen at 12 weeks. Every patient is different. We will work with you to develop a customized treatment plan to meet your desired goals. Call Innovative Primary Care to schedule a consultation and discuss what treatment plan is best for you. During this non-invasive laser treatment, it goes through a process of intermittent heating and cooling. Most patients feel a tingling sensation intermittently throughout the treatment which is generally well-tolerated. The number of fat cells stored in our bodies typically remain constant throughout adult life. As we lose weight, the size of fat cells become smaller, but typically do not decrease in number. Even with diet and exercise, many people have difficulty losing weight in certain trouble areas. After the SculpSure treatment, the destroyed fat cells will not return making a slimmer, more sculpted appearance possible with the help of SculpSure. How much is SculpSure and are there payment options? Because every patient is different, we recommend you come in for a free consultation with one of our providers to discuss and develop a customized treatment plan to meet your desired goals. Payment is due in full following each SculpSure treatment. Achieving a slimmer, more sculpted appearance is possible. 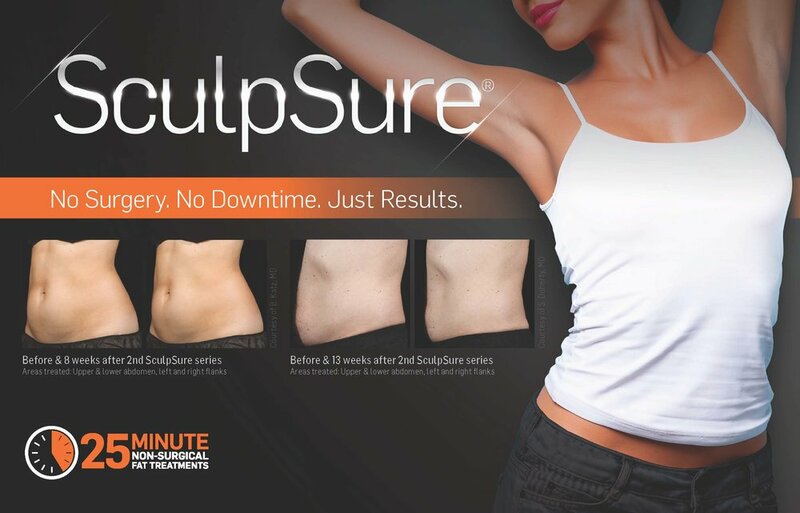 Call IPC at 480.776.0626 to schedule a consultation and learn more about your customized SculpSure treatment. *Single treatment with an average in fat volume as measured by MRI; Clinical and Histological Evaluations of a 1060nm Laser Device for Non-InvasiveFatReduction-JohnW.Decorato,MD.,FACS.RafaelSierra,Ph.D., BoChen,Ph.D.,Westford, MA, 2014. **Average patient discomfort rating of 3.7 on a scale of 1-10; Katz B,Doherty S. A multicenter study of thesafety and efficacy of a non-invasive 1060 nm diode laserfor fat reduction of the flanks. Paper presented at: 2015 Annual American Societyfor LaserMedicine and Surgery Conference; April 22-26; Kissimmee, FL.